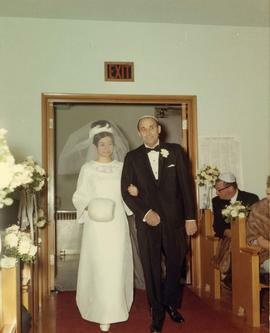 Photograph depicts Shriley Barnett (nee Dayson) being led down the aisle at her wedding by her father, Ben Dayson. 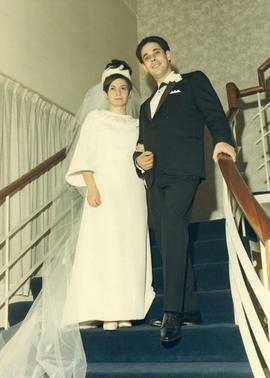 Photograph depicts Shirley Barnett (nee Dayson) and Peter Barnett posing on stairs. Photograph depicts Nathan Nemetz in Tel Aviv, receiving Honorary Degree from University of Tel Aviv. Photograph depicts Nathan Nemetz receiving Homorary Degree, LLD., at University of British Columbia. Colour Munshaw 35mm slide depicts four Shriners in uniform marching with flags. Three have American flags and one is carrying a British Red Ensign flag.Note: colour adjusted on the jpg. Photograph depicts Alec Jackson and others posing with a newly received award at a convention in Phoenix in 1968. Photograph depicts Alec Jackson honouring a newly installed B'nai B'rith member at the installation ceremony. Photograph depicts a newly installed B'nai B'rith member shaking hands with an unidentified man during the installation ceremony.